Philadelphia, PA – It was a near perfect evening at the 76ers 5th Annual Greek Heritage Night. Every cultural feature went off without a hitch, and the matchup between the Sixers and Giannis Antentokoumbo’s Milwaukee Bucks was an impressive battle between two titans of the NBA East. After the game, Greek-American fans assembled in anticipation of seeing their hero, their shining star of Hellenism. But then it happened. The Milwaukee Bucks pulled the plug on the party. The Greek-Freak would not be allowed to come out and meet his Philly Greek Fans. It was like that green-skinned Grinch stealing Christmas. What a bummer. When the announcement was made, some of the fans, walked out. A few young Greek children sitting with their parents and wearing Giannis Bucks jerseys even shed a tear. There was a giant collective sigh in the air as the emotional let down appeared on everyone’s face. This was the second year in a row that Greek Heritage Night ended in disappointment. Last year, Giannis was hurt and was not present in Philadelphia for Greek Heritage Night, so it was no surprise. But why last night? Well sports fans, we got the scoop shortly afterward. The Bucks wanted Giannis to stay focused. So fan visits were now off. The Sixers front office representatives quickly worked out a plan as the crowd stood by looking bewildered. They brought out Allen Iverson, a former Sixers and NBA star, now retired. Iverson’s star power saved the evening from being a letdown. Or did it? Either way, the Sixers should be grateful they had him around last night to deflate what could have been an ugly situation. Iverson was escorted into the center of the crowd by security guards behind the basket where approximately 700 fans were waiting. Many of the fans reached out to shake Iverson’s hand and for a photo op. Iverson thanked all the loyal fans before blowing them several kisses and then was quickly escorted away. The ploy to save the evening by the Sixers front office apparently worked. The distressed fans were calmed and then assembled for their evening on the court. They were escorted onto the court like cattle into boxcars. 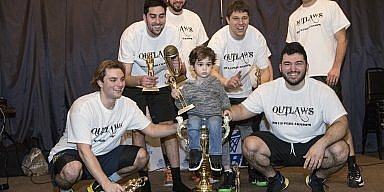 They were given a minute to take a shot on the basket and then a quick photo opportunity before being booted off the court. It was like waiting in a long line at an amusement park for a one minute ride. In the past, there was free reign to spend some time on the court, to grab a selfie and mingle with fellow Hellenes. But now, this was a different Sixers front office. It was all business. The Sixers have become a star-studded team that sells out the Wells Fargo Center, and fans are in abundance. 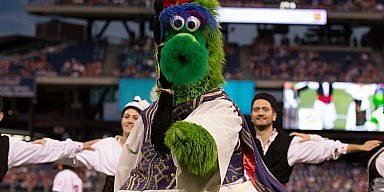 When we look back on this year’s 76ers’ Greek Heritage Night, we will remember the capacity crowd and Bryce Harper of the Phillies making a special appearance before the game. We will remember the Greek American community showing up in full force and the presence of the Greek Military Guard, the Evzones from Greece. We will also remember the singing of the Greek National anthem sung by Lena Iliadis, and Greek dancing by St. George and the Pan-Macedonian’s dance groups. But until Greek American fans see their hero again, Giannis Antentokoubo, there will be an empty sigh.